VGA KVM Extenders | Simply Connect Pte Ltd. The CE252 allows access to your KVM installation through a local console,or a remote console placed up to a distance of 300m(1000') away. Both the local and remote units support PS/2 consoles. 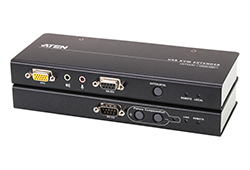 The CE750 is a USB based KVM Extender with automatic signal compensation and RS-232 serial functionality that allows access to a computer system from a remote USB console (USB keyboard, monitor, and USB mouse) .